Hey Cheese Peeps! In an effort to alleviate the hate mail I’ve been getting because all of my Wisconsin Cheese Originals classes are sold out through the end of the year, I just added four new tasting and talking classes. Whoo-hoo! You get to hang out with me, Jeanne Carpenter, American Cheese Society Certified Cheese Professional, on a Sunday evening and taste and learn about at least four different cheeses each time. You may purchase classes separately for $25 each, or purchase the entire four-class series for $90. We meet at the lovely Firefly Coffeehouse, 114 North Main Street in downtown Oregon, Wisconsin, located just a quick 10 minutes south of Madison. Classes start at 6:00 pm. Each is limited to 20 attendees. Classes include a complimentary glass of wine, beer or beverage of your choice. Start out with an introduction to the eight different types of cheese – fresh, semi-soft, soft ripened, surface-ripened, semi-hard, aged, washed rind, and blue. Learn and taste your way through your very own cheese board of eight artisan cheeses, then take the board home and impress your friends with your new-found knowledge. Perhaps some of the most eye-appealing and palate-pleasing cheeses are those hand-crafted on the same farm as where the animals – cows, sheep or goats – are milked. Learn the stories and taste four of the best farmstead cheeses made in America today. Give yourself an early holiday gift with tickets to this festive tasting of four American artisan cheeses paired with four different chocolates from local chocolatiers. Learn tips and tricks of pairing sweet with savory, and get ideas for holiday gifts for your friends and family! Today is cheesemaker Veronica Pedraza’s birthday and I think we should celebrate with beauty shots of her fabulous cheeses. For those of you not in the know, Veronica is the lead cheesemaker at Meadowood Farms in New York. She is also a former monger, spectacular fellow member of the American Cheese Society Education Committee, and is an honorary Wisconsinite, as she attended Beloit College and has been overheard appreciating how just gosh darn nice we are here in the Midwest. Ledyard: Veronica was inspired by Robiola and St Marcelin when she created this beauty. A soft-ripened sheep’s milk cheese, it is wrapped in grape leaves soaked in Deep Purple, a wheat beer made with Madison County concord grapes. Strawbridge: in Wisconsin, we have a dearth of non-stabilized soft-ripened cheeses, so this bloomy-rind sheep’s milk cheese especially speaks to me. When it’s young, it’s easy to eat and agreeable to all, but as it ripens, it develops the bold mushroomy flavors of a real Camembert. Similar to a triple crème, it is decadent and buttery. Juvindale: this is about as close as you’re going to get to Reblochon without paying the European airfare to eat the original. Made with cow’s milk, the rind is thin and pillowy, with a buttery, tangy paste with just the right amount of barny pungency. Happy birthday, Veronica! You have a fan club in Wisconsin. Your cheese makes us happy. Photos by my fabulous husband, Uriah Carpenter. After teaching a small group cheese class last week, I discovered how much I enjoy sitting down with a few folks, cutting into some wheels of cheese, and taking a deep dive into a topic. So voila – a new series of what I’m calling “Cheese Geek Classes” have been born. Each class is limited to just eight people. We’ll sit around a table, eat some cheese, study a topic in-depth and probably drink a beer or two. I hope you’ll join me! Looking for a fun way to taste and learn about artisan cheese? Bummed because most of the Wisconsin Cheese Originals cheese classes at the Firefly Coffeehouse in Oregon are sold out for 2016? Fear not! I’ve just announced a new spring cheese class series at Metcalfe’s West Café in Madison. Each of the spring classes will be held on Tuesday nights and each revolves around a specific topic, including why Cheddar tastes different in Wisconsin, a look at the science and art of cheese rinds, and the terroir of Alpine style cheeses. You’ll enjoy a tasting and storytelling of four artisan cheeses, as well as a complimentary blended drink, coffee or beverage made by the fine folks at Metcalfe’s West Café. Cheddar in Wisconsin comes in every size and age imaginable. But the difference in taste can be significant, and is attributable not only to the forms used or aging techniques, but to the region in which it was made. Ask any old timer with Cheddar still stuck in his teeth, and he’ll tell you Cheddar used to taste different from one local factory to the next. Today, thanks to modern science, distinct flavor differences are being recorded between Cheddar made in western Wisconsin’s Driftless Region and in eastern Wisconsin’s glaciated region. Discover four different Wisconsin Cheddars, from aged block Cheddar, to Bandaged Cheddar to Cheddar made in 22-pound “daisy” wheels, to Cheddar Blue. To eat or not to eat? ‘Tis the age-old question of cheese rinds. In this class, we’ll explore different types of cheese rinds: from bloomy mold on Brie, to ash on surface ripened cheeses, to natural rinds on Alpine-style and washed rinds on stinky cheese. And of course, we’ll taste exquisite examples of each. Learn more about the science and art that cheesemakers must undertake to create a beautiful and edible rind. Why do cheeses made in the mountains of France and Switzerland taste different than cheeses made elsewhere? 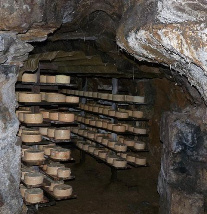 Is it the alpage grasses, the techniques of making cheese, or hundreds of years of experience? We’ll taste two European Alpine cheeses and two Wisconsin Alpine-style cheeses and compare to see if cheesemakers in America’s Dairyland can match the terroir – or taste of place – of the Alps.